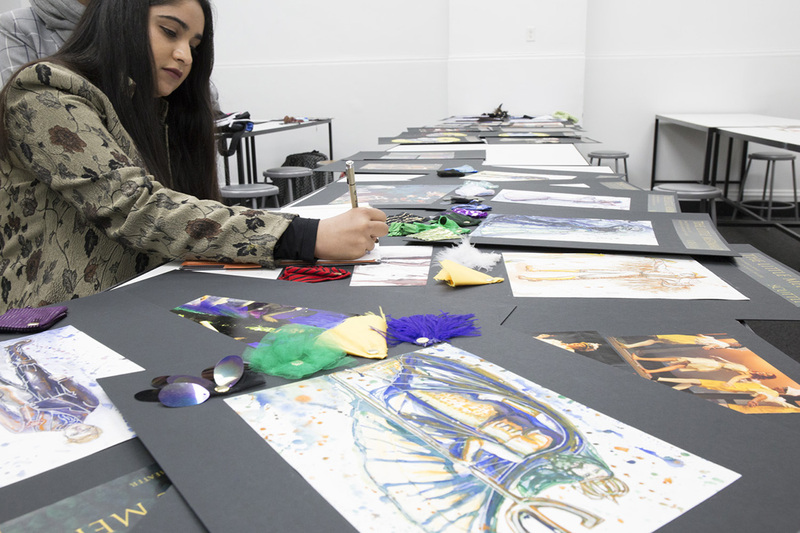 From growing up in Los Angeles and studying at San Francisco’s Academy of Art University, to landing a dream position in Portland, Oregon, the concept of “moving up” is more than figurative for the B.F.A costume design student Zahra Jangbar. 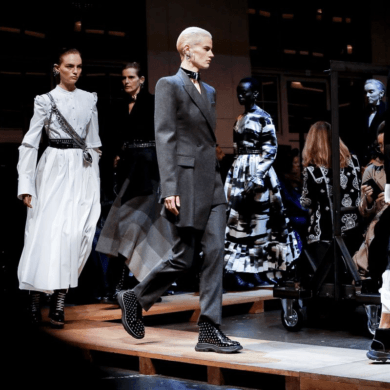 The 23-year-old designer began her burgeoning career as an onsite student at the School of Fashion Costume Design department. Then, after working as an assistant costume designer with celebrated costume designer Deborah Cook at the Laika studio, Jangbar’s path shifted. In each film, the characters seem to come alive — not only in their intricate movements but through their costumes. Powerful personalities come to life after intense research of fabrics, textiles, embroidery, and silhouettes, all of which are carefully selected through microscopic lenses and tech. Fashion School Daily caught up with Jangbar to discuss how she discovered her path, her Bowie inspirations and the experience of creating small-scale costumes on not-so-small technologies. Fashion School Daily: Tell us a little bit about yourself. Zahra Jangbar: My ethnicity is Pakistani, but I was born and raised in L.A. I like to get out in nature any way I can by hiking, swimming or paddle-boarding. I love reading about history, going to museums and going to events in the Bay Area vintage community. I have been working in the local Bay Area theater scene for the past three years getting involved in all sorts of performance projects. 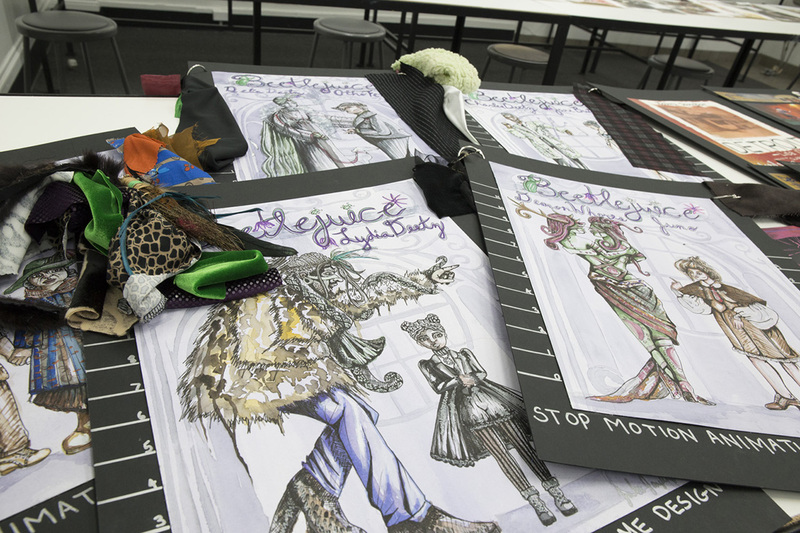 FSD: What inspired you to pursue a career in costume design? FSD: What inspired you to work in stop-motion? ZJ: I would never have guessed I’d be working in animation. I didn’t even really understand it as a field when I first applied for the internship. I just saw the movie “The Boxtrolls” and I thought the costumes were so stunning that I looked up the studio and kept track of job openings there. FSD: Congratulations on getting hired at Laika! Tell us about your experience so far. ZJ: My experience has been an absolute whirlwind. I am challenged at the studio every single day to my limits — but in a good and supportive way. I find myself constantly out of my depth and having to find creative solutions to the challenges I face. What I love most is that the work that we do is so technology and science-based — I still sit in meetings and have no idea what the artists are talking about! The level of detail and thought that is put into every minuscule detail in the films is mind-blowing. I am incredibly grateful and humbled to be allowed to be a part of these amazing artists’ process. FSD: What responsibilities do you have working in the research and development department? ZJ: My role changes from day to day, depending on the needs of the designer. What I love about my work is that I get to spend my days learning from [Deborah Cook] and helping her with her process. Some duties I have include: preparing press and marketing boards for tours and museum exhibits, helping design and maintain updates on background characters, doing research for various costume items that come up, creating costume launch materials that get distributed to various departments and managing the communications between designer, fabric developer, costume illustrator and costume fabricators. I am kind of like the coordinator of the whole team and I help them work together to create the designer’s vision. FSD: Cook has a precise process in designing for stop-motion. How are you applying what you learned from Academy of Art? ZJ: There are several things that I learned that have become key in my job. One of them is a deep and scientific understanding of fabric technology. At Laika, Cook develops all the fabrics from scratch and has them dyed, printed, or embroidered to suit their exact needs. Being able to truly understand this process is invaluable. Another skill I learned from the Academy is digital design. I work almost entirely digitally and the pace of the studio is incredible. I have to Photoshop faster than I can think most days and that is something I learned in the Digital Techniques class. Another skill I learned in my design classes is how to break down a script with plot points, set designs and character arcs in detail — which is an intricate and brain-bending process at Laika. 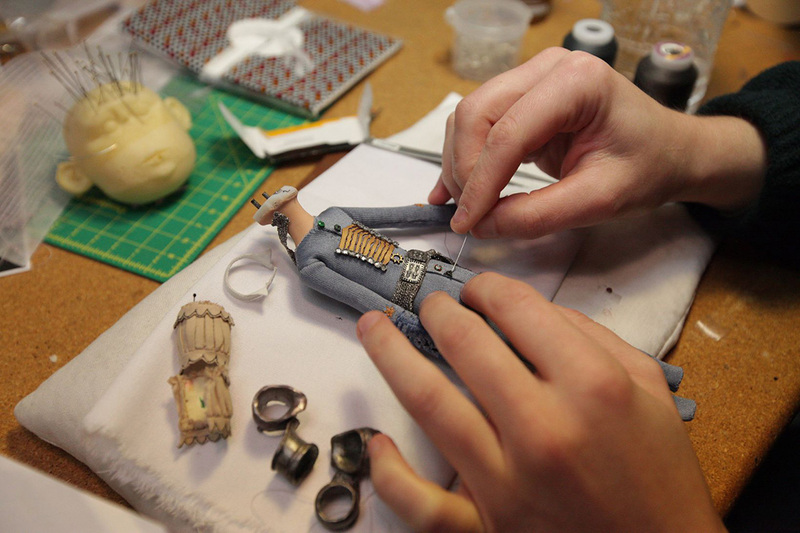 FSD: What are the challenges and rewards of working in stop-motion costume design? ZJ: The challenges are unlimited every day! There are certain fabrics that can’t be used, certain techniques such as a fur or fuzz, beading or tight-weaving, which create “strobing.” The puppets get degraded the longer they are animated. The silicone bleeds through the fabric. The puppet’s costume might limit its movement. Everything is on a tiny scale. We once looked at a 3D-printed button so tiny that the designer asked for magnifying goggles just to see it. This is what I love; every day is a challenge that has never been solved before. The reward is being able to bring to life a vision of something that didn’t exist a few months before and the time and careful attention to detail that is given in each part of the final product. I think it’s amazing to work in an environment in which every button, every stitch, and every crease is carefully designed and controlled to create a feeling of a complete world. FSD: What are you most looking forward to learning from this experience at Laika? ZJ: I am looking forward to learning more about fine art, illustration, and sculpture. These are topics that are touched upon in the fashion department but are not ultimately the purpose of fashion design. But in animation, the focus is more on just aesthetic quality, mood, storytelling and sometimes experimentation. I also look forward to working in an industry that is firmly rooted in emerging technologies, such as 3D printing. I think that in the modern world, it’s a mistake not to make learning new technology a priority. FSD: What are the lessons you are taking with you from the Academy? ZJ: I really developed a sense of work ethic at the Academy. The way the teachers drive you to succeed beyond your known limits can be stressful, but it is ultimately the only way I learned how to grow. I think that there is something amazing about the Academy in that they have open registration — which means that the ethics of the school revolve around the idea that art can be taught; it’s not an inborn talent, and if you work hard enough you can have the skills necessary to work in the industry. It’s kind of like as soon as you enroll, they believe that you can succeed if you try. FSD: Now that you’ve moved to Oregon, what do your days off look like? ZJ: I was amazingly lucky to find a little cottage to rent with a yard full of big trees by a charming elderly couple who just needed someone to care for their house that they loved. I spend my days tending to my yard, taking long walks in the stunning Northwest forests, taking fencing lessons and going to the Korean baths and spa. I am really enjoying the blend of gorgeous, whimsical wilderness and quirky urban culture Portland uniquely has to offer. FSD: What is your advice for other costume design students? ZJ: I’m not really qualified to give anyone else advice, but I think it’s important to remember that it often takes a huge amount of commitment and sacrifice before you see results. There were many points in my journey in which I felt like quitting or I felt that it wasn’t worth it. I had many days when I was sure that I wasn’t passionate about costume design anymore. But, there’s some magic that happens, I think, when you stick with something for a long time and refuse to quit.